Confirm that the tilt rod goes through the tilter mechanism and has not slid out of place. Tilt rod should not be impeded from turning by the end stiffeners or the center lock. Tilt rod should be approximately 1-1/2" less than the headrail size so it does not go under any part of the end lock. This may bind the tilt rod from turning. Make sure that the tilt rod is not bent. Confirm that the tilter mechanism is completely set into the headrail of the blinds. Make sure that the tape roll/drum is properly set in the tape roll support/cradle. The tape roll/drum must be centered in the tape roll support/cradle in order to turn freely. Placement of tape roll supports and tilter should allow the tilt rod to turn without tension. 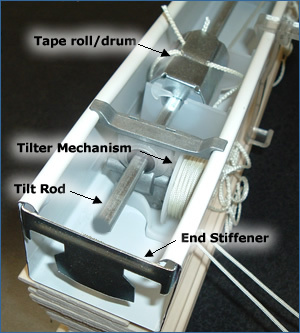 The tilt rod should not bend in order to insert into the tilter gear or to run through the tape roll supports. Attempt to spray the headrail components (including the tilter & tape rolls/drums) with a silicon spray. This may remedy abnormal stiffness and squeaking. If all of the above methods fail or when it is obvious that the gear in the tilter has worn out or is defective, replacing the tilter may be necessary.